Tuesday at Cowes dawned with plenty of sun and light southerly winds that started to build at 0900, reaching 10-12 knots by the time of the first starts. Later the breeze increased still further, to give puffs of up to 16 knots by late morning, before easing back to a mean speed of just over 10 knots. White Group dayboats that started from the Royal Yacht Squadron line headed towards the east, fighting an ebb tide. Despite this, a lot of boats were over the line at the gun, and two starts had to be recalled. At the other end of the spectrum were those who allowed themselves to be swept too far down tide of the start. Most of the successful boats started around one-third of the way out from the shore, where they gained some advantage from a weaker tidal stream but were also able to protect their air from other boats. In the Sunbeam class three boats – Peter Nicholson and Mike Hollis’ Dainty, Stuart Reed’s Firefly and Joe Burnie’s Fleury – were over the line at the gun, but Dainty was the only boat to return. Of the boats that started correctly, Becky Wickens’ Betty and Tim Hill’s Query looked well placed, as did John Ford and Johnny Hornby’s Melody and Roger Wickens’ Danny a few lengths closer to the shore. As they crossed the Medina estuary Melody pulled ahead of these boats, with Danny following very close behind and a little to windward. Approaching the finish there was a close battle for first on the water between Melody and Fleury, the former pulling a couple of lengths forward and finishing six seconds ahead. But with Fleury having been OCS, it was Danny finishing 25 seconds later that took second place, with Julian Money’s Penny third. The first start for the 24 Redwings was abandoned when a large mass of boats was already over the line a few seconds before the gun. Their next start was black-flagged, indicating any boat over the line, or its extension in either direction, in the final minute would be disqualified. Bruce Huber’s Quail just managed to return, with seconds to spare, but Mark Andreae’s Prawn fell foul of the flag. At the gun George Greenwood’s Rosetta was closest to the line, with the spotters on the platform at the RYS keeping a close eye. Nick Wakefield’s Bizarre led the boats closest inshore, but having started more towards the middle of the line, Andrew and Sabrina Eddy’s Plover was just ahead of the boats around her and in clear air, enabling her to pull away from the fleet. However, by the fleet’s first mark, West Ryde Middle, the overall leader, John Raymond and Matt Alexander’s Harlequin, had emerged as leader. They held the lead to the finish, to take their third win of the event. A close finish between Plover and Colin and Becky Samuelson and Peter Harvey’s Toucan saw the latter take second by a five-second margin. With three firsts and a second place, Harlequin now has a 21-point lead over Michael and Rupert MacInnes’ Avocet. Swallows and Flying 15s had a general recall for their first start and a Z flag for the second, with three boats incurring a penalty for being on the wrong side of the extension of the line. Yesterday’s winning Swallow, Mike Moss and Guy Foll’s Spectre, also gained a penalty when she became OCS with a few seconds to go. Mike Wigmore and Mark Struckett’s Gwaihir, starting near the inshore end of the line picked up a useful gust to pull clear ahead of the fleet, with Spindrift and Sir Malcolm Green’s Archon also looking well placed, although a little further back. The race was won by Harry Roome, Prue Roome and David Lees’ Skua, with Gwaihir second and Charles Fisher and Richard and Carol Thompson’s Migrant third. On the long final leg from Lymington Bank to the finish, a heading wind shift forced Pace to sail lower relative to the wind and therefore in a stronger adverse tide under an A3 asymmetric spinnaker. For a while it looked as though Powerplay, which deployed a FRO (a sail developed for the Volvo Ocean Race for use in exactly these conditions) would pull away from her older rival. She took line honours, but with Pace finishing just 49 seconds later Pace won on corrected time by more than a minute. In IRC Class 1 the Ker 40 Keronimo negotiated big changes of wind strength and direction on the final leg to take line honours five minutes and 14 seconds ahead of Willem Wester’s Grand Soleil 46 Antilope. It was just enough to secure victory for Keronimo by a margin of just six seconds on corrected time. Another Ker 40, the Jamie McWilliam skippered Peninsula Signal 8, was third across the line, but dropped to ninth on handicap. On corrected time, third place went to Mike Bartholomew’s King 40 Tokoloshe. In the Contessa 32 class, opinion was divided as to which end of the line would be favoured for the short close reach from the start to Quinnell. Rob Duke, Oli Donaghy, Dani and Rupert French’s Gualin opted for the northern end of the line. However at the opposite end Ken Mizen and Don Laing’s Blue Shark timed their approach to perfection and then immediately hoisted a spinnaker. Eldred Himsworth’s Drumbeat, a little behind Blue Shark, quickly followed suit, as did Ray Rouse’s Blanco and Keith Hardy’s Jemma of Bosham. However, it was only Blue Shark that was able to hold the sail to the mark, with the other boats being forced to drop early. Gualin’s crew held their nerve, staying under white sails, and were second to round Quinnell, a length and a half astern of Blue Shark, with Blanco a similar distance behind in third. By the finish Gualin had slipped to fourth, while Blanco and Drumbeat both overhauled Blue Shark to take first and second respectively. In the Sunsail F40 class the fleet was similarly spread evenly across the line, with Powell Systems Engineering winning the north end, although within a couple of minutes the Pip Hare skippered Cazenove Absolute powered over the top of her. 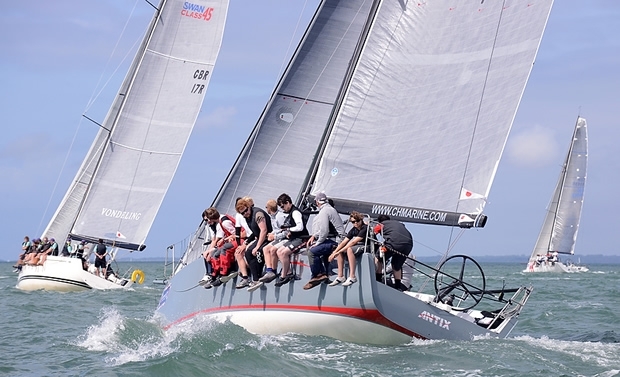 Eden Yachting also showed good speed, but it was the boat that won the southern end of the start line, Dan Sanders’ Coast Graphics, that emerged as a clear early leader as the boats sailed south of the Beaulieu River on the way to Hamstead Ledge. These three boats dominated the race, with Coast Graphics finishing first with a three-minute advantage over Cazenove Absolute. Dubai-based Eden Yachting was third, just 17 seconds later.